Taking us back roughly 45 million years into the Eocene, "the dawn of recent life," Chris Beard, a world-renowned expert on the primate fossil record, offers a tantalizing new perspective on our deepest evolutionary roots. In a fast-paced narrative full of vivid stories from the field, he reconstructs our extended family tree, showing that the first anthropoids—the diverse and successful group that includes monkeys, apes, and humans—evolved millions of years earlier than was previously suspected and emerged in Asia rather than Africa. In The Hunt for the Dawn Monkey, Beard chronicles the saga of two centuries of scientific exploration in search of anthropoid origins, from the early work of Georges Cuvier, the father of paleontology, to the latest discoveries in Asia, Africa, and North America's Rocky Mountains. Against this historical backdrop, he weaves the story of how his own expeditions have unearthed crucial fossils—including the controversial primate Eosimias—that support his compelling new vision of anthropoid evolution. 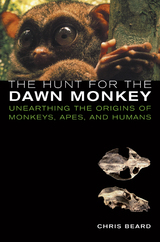 The only book written for a wide audience that explores this remote phase of our own evolutionary history, The Hunt for the Dawn Monkey adds a fascinating new chapter to our understanding of humanity's relationship to the rest of life on earth. Chris Beard is Curator and Head, Section of Vertebrate Paleontology, Carnegie Museum of Natural History and winner of a MacArthur "genius" grant.